The EPA has posted the official range and efficiency numbers for the Tesla Model 3 All-Wheel Drive (AWD) and AWD Performance Edition, revealing a 10% lower efficiency for the All-Wheel Drive and AWD Performance Edition compared to the Rear-Wheel Drive (RWD) configuration. 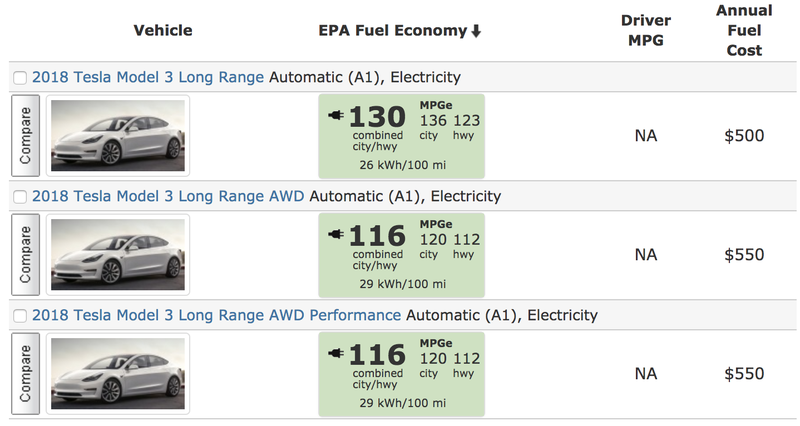 The difference in efficiency translates to 130 MPGe for the RWD compared to a flat 116 MPGe for the AWD and AWD Performance Edition. 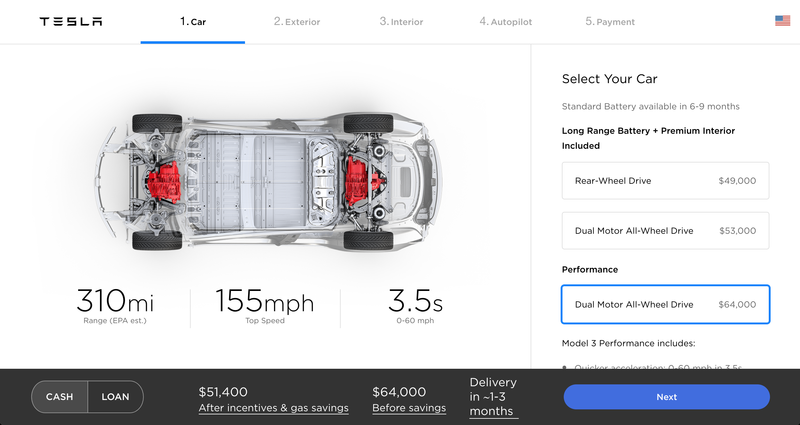 In miles per kilowatt-hour, drivers of the RWD configuration should net 3.85 miles per kilowatt-hour compared to just 3.45 for the dual motor builds, according to the EPA. The news comes as a shock to many, as the All-Wheel Drive configurations of Tesla’s previous vehicles all resulted in higher efficiency ratings due to the car’s ability to use the lower-power front motor to keep the vehicle pulsing along on the highway. The higher-power rear motor balances the equation by providing extra power when starting out and when maximum acceleration is requested. 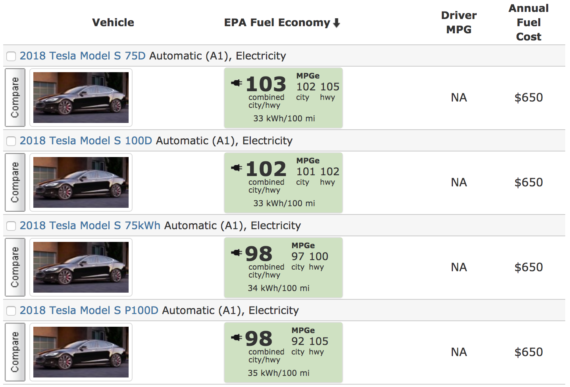 The Tesla Model S 75, for example, achieves an EPA Fuel Economy rating of 98 MPGe while the All-Wheel Drive 75D achieves a rating of 103 MPGe. The realization that the dual motor configuration is less efficient than the RWD configuration will surely come as a surprise to many owners and potential owners, but at a meager 10% difference, it isn’t likely a game changer for buyers who were willing to pony up a few thousand more for a faster build. The curiosity adds to the strange relationship between Tesla and the EPA. 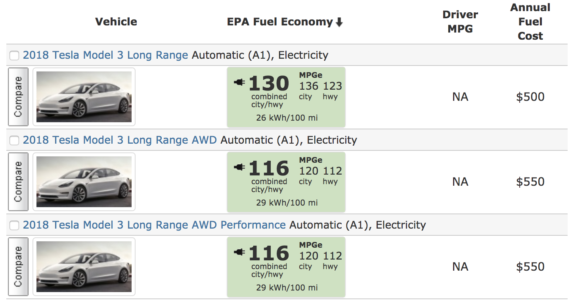 Remember that it initially asked the EPA to state a lower range than actually achieved with the Model 3. It’s reported that the rating should have been a range of 334 miles on a full charge, but Tesla asked the EPA to state just 310 miles in the official rating of the vehicle. The reasons for this are unknown, but one point of speculation is that Tesla was asking for the lower rating to account for future power draw from the vehicle’s onboard autonomous driving system when it is going full blast. Another theory is that Tesla just doesn’t want people to be disappointed with the range in the middle of winter in Chicago or such, especially as more mainstream buyers come into the fold who don’t obsessively explore the physics of EV driving . Now that the world has had some time with the Model 3, we have learned that the Long Range build can achieve more than double the stated range, with a team in Germany setting a new world record of 622 miles on a closed track with a non-human driver. It’s amazing how much you can boost range when you drive slowly. CleanTechnica has reached out to Tesla for comment on the rating and will update this article if/when we hear back.